S.H. Figuarts Kyoryu Red Gallery 2.0! TokuNation has slowly begun the process of going through it’s archive of toy galleries to revamp some of our older work and re-present to the community. This process began with our Gokai Christmas Gallery 2.0 and today we continue it in honor of the upcoming February 7th premiere of Power Rangers Dino Charg! It’s time to check out the S.H. 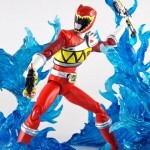 Figuarts Kyoryu Red Gallery 2.0! Released way back in October 2013, Kyoryu Red was the first figuart from Zyuden Sentai Kyoryuger, though far from the last. Kyoryu Red began a new era of consistency and detail in sentai figuarts that for the most part has remained consistent since. Daigo, includes a plethora of accessories that really make this release one of the best for 2013 and still one of the best Sentai Figuarts to date. The included Gaburevolver, Gaburicalibur, and even Gabutyra Fang & Zyudenchi allow this figure to really capture the wild flexibility and mannerisms of Kyoryu Red and look fantastic wild doing it. Frankly S.H. Figuarts Kyoryu Red is one of my absolute favorite figures. And it’s still cheap on most secondary market websites! This figure and the remaining Kyoryugers won’t be imported by Bluefin so now’s the time to jump on it before the actual premiere of Power Rangers Dino Charge drives up demand with Western fans. For now though feel free to browse through a full 80 image gallery of this incredible figure after the jump! We’ll be back soon with 3 more Gallery 2.0’s as well focusing on the other 5 Kyoryugers! 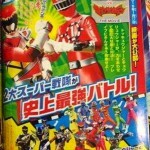 Another image from the upcoming crossover film Ressha Sentai ToQGer VS Kyoryuger: THE MOVIE has been posted online. 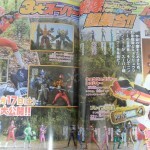 This scan confirms that all 10 Kyoryugers will indeed appear in the crossover! In addition, the upcoming Super Sentai team Shuriken Sentai Ninninger will make their first on-screen appearance in this special! Finally, this magazine scan highlights the return of the Kyoryuger Ressha– part of a special transformation unlocked during the Hesei VS Showa Featuring Super Sentai Movie War released earlier this year. ToQGer VS Kyoryuger is set for release on January 17, 2015! Stay tuned to TokuNation as we keep you up to date on this brave imagination experience! Tis the season of giving! And while you’re doing your holiday shopping in stores or online this year, you may be a little stumped on what to get the Power Rangers fan on your Christmas shopping list. 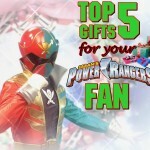 But never fear – TokuNation.com is here, and we’ve compiled a list of what we consider the Top 5 Gifts for Your Power Rangers Fan! These are all realistic items, so there’s nothing super rare, super old, or super expensive on the list (no Legacy DVD Collections on our list … but that doesn’t mean we don’t want it!). Check out our list by clicking “Read More”. What do you think of our list? What would be on your list? Join the discussion by clicking the discussion link below! And don’t forget – we’re actually giving away some of the items on our list in our Toku Toy Box Give Away! All you have to do is register on our site and post in the galleries that are qualifying entries for your chance to enter and win. For a full set of rules, click here! Full ToQGer VS Kyoryuger Trailer Now Online! Toei’s official Youtube channel has put up a full-length trailer for the Super Sentai teamup special Ressha Sentai ToQGer VS Kyoryuger: The Movie! Can Imagination & Bravery unite to stop the newest evil!? Fans will find out on January 17, 2015! Another brief teaser for the upcoming Super Sentai teamup project Ressha Sentai ToQGer VS Kyoryuger: The Movie is now online! This new video gives us a quick look at the new villains and a few good action shots. ToQGer VS Kyoryuger premiers in theaters January 17, 2015! Stay tuned to TokuNation until then as we keep you up to date on all crossover news! Our site sponsor BigBadToyStore.com have sent out a new E-mail announcing their Holiday Sale as well as new pre-orders and new arrivals! The cool thing about their Holiday Sale is that they’ve broken it down in to two categories – gifts over $50 and gifts under $50. Looking for some toku merchandise for yourself or that special someone this holiday season? We’ve created our cheat sheet – check it out below after the new pre-orders and new arrivals! HOLIDAY SALE – TOKU GIFTS OVER $50! As always, we’ve listed the newsletter in the “Read More” portion of this story. Happy toy hunting/purchasing! Can’t recommend grabbing that S.H. Figuarts Kyoryu Red figure at that price – he will NOT be that cheap in the future once Power Rangers Dino Charge begins airing! Toku Toy Box 2014 Giveaway Announcement! It’s that time of year once again! Time for the members and staff of TokuNation.com[/URL] to celebrate their respective holidays with their loved ones. But it’s also time for TokuNation to celebrate. Our little community is about to hit yet another milestone, our 3 year anniversary!! January 4th 2015, will officially mark 3 years of TokuNation growing into the incredible community it’s become. As we’ve done in the past we want nothing more than to continue to grow this community. To strengthen the bonds it’s helped forge. To continue to bring you up to date news, rumors, images, videos, podcasts, and the welcoming community atmosphere you’ve all come to know. But we also want to bring you just 1 more thing. Our annual Toku Toy Box Giveaway! Like years past TokuNation is hosting an annual holiday giveaway open to our users! You’ll recall that for last years giveaway[/URL] users could post in a selection of galleries within the contest period to automatically be entered into the drawing for 1 of 4 prize packs. Well this year we’re going the same route, but we’re charging up this contest even further! To show our appreciation to you, the community, we’ve assembled 4 MASSIVE prize packs spanning Power Rangers, Super Sentai, Kamen Rider, Godzilla, Ultraman, and more! With a little help from Zyuden Sentai Kyoryuger & Power Rangers Dino Charge this will be our biggest giveaway yet! Click “Discuss on the TokuNation Forums” at the bottom of this post to be taken to the official rules and prize pack reveals of Toku Toy Box 2014! For now though, thank you. Thanks to all of you who continue to call this place your home for news, discussion, images, sales, friendships, artwork, videos, podcasts, and everything else in between. Happy holidays from us, and best of luck in our giveaway! It’s our gift to you. Another special episode for Ressha Sentai ToQGer will be released via magazine-exclusive DVD pack-in this December! 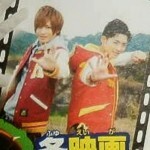 *A trivia contest between Right/Toq 1 and Daigo/Kyoryu Red! Can the ToQGer’s imagine their way to victory once more?? Stay tuned to TokuNation and find out!